Willman “Bill” Plummer spent 28 years overseeing the construction of schools and support facilities in Aldine ISD. He oversaw a number of major construction projects and helped the district grow into one of the best constructed school districts in the state, and to honor Plummer for his years of dedication to the students and staff of the district, the Aldine Board of Education will name the districts newest middle school after him. The board gave its unanimous approval to name the districts ninth middle school in Plummers honor during the May 18 board meeting. Willman “Bill” Plummer Middle School will open at the start of the 2005-06 school year and will be located at 11429 Spears Road. Plummer started his education career in Aldine ISD in 1967 as a physical education teacher and coach at Drew Junior High School. Seven years later, he accepted an assignment as an assistant principal at that same school. In 1975, he was named director of buildings and properties and in 1981 he was named executive officer of buildings and construction. In 1986, he was named assistant superintendent of buildings and construction, a position he held for 13 years until he was named deputy superintendent of operations in 1999. Plummer retired in 2003, but not before he had devoted 36 years of his life to the students and staff of Aldine ISD. During the board meeting, trustees praised Plummer for his ingenuity and expertise in helping build Aldine into one of the most efficiently constructed school districts in the state of Texas. I have served as President of the Aldine ISD Council of PTA’s for the past two years. I am very pleased to have been associated with this fine organization. In reading your latest edition dated April 27, 2004, I came across an article in which I found incorrect information regarding the Aldine ISD Council of PTA’s. The article was entitled Aldine School Board early voting begins April 28. In the article, under the information for Position 3 Sidney Brewer, he stated that he had been named the 2004 Aldine Council of PTA’s Community Partner of the Year. I know for a fact that this is an untrue statement. The only awards we presented were two PTA Life Membership awards at our annual PTA Founders Day banquet. Mr. Brewer may have been awarded a Community Partner Award from an individual campus but not the Aldine Council of PTA’s. We are pleased to have school board members as well as school board candidates involved in PTA’s at the local unit level. 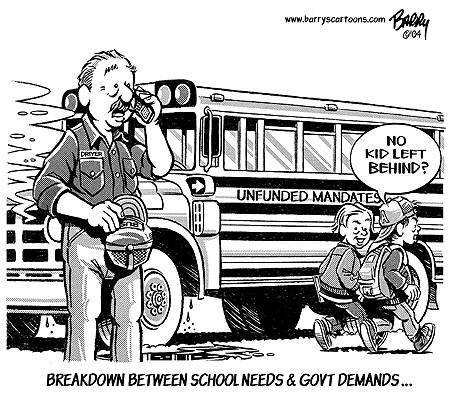 PTA may sponsor a community forum for political candidates running for office. All candidates should be invited to participate and each allowed equal time for promoting their platform. PTA, however, cannot endorse a candidate for a specific office. The forum is provided as a community service. I thank you for reviewing this request and look forward to seeing a correction printed in a future issue of the Northeast News. Me and Four Dog ought to be down at Day Lake this morning drowning minnows instead of having to hang around the house all day. Actually water is just below flood stage at Day Lake so that means the snakes are floating around or in the trees. Not to mention the globs of fire ants afloat. I was in Wal-Mart a little before 0700 this morning and two guys were walking out with flowers. Seems like every other cart had a flower arrangement so I mosey on over to the floral area and itÕs about empty with a lot of ugly stuff left and a few roses which I do not buy. Guess sheÕll just have to settle for some homemade jam; homemade in her home no doubt. My almost 80 year old second cousin and her husband came by for a visit. They are on their way from Hemet, California to Ohio by way of Baytown, Texas, Sarasota, Florida, East Point, Georgia and no telling where else. Her mother and my grandpa were brother and sister so. We visited their home back when one of the twins was in the Marine Corp back in the early 90Õs and my Aunt Pearl, also in her 90Õs was alive at that time. I asked her what does she contribute to her living so long and she told me she had a drink of whiskey every day. Interesting to listen to this almost 80 year old cousin and her husband. They met when she was six, he was nine and they were neighbors. Been married all these years. She was folding towels one evening and I told her not to bother and she proceeded to tell me about the company they had and didnÕt want us to think they were like them. She said one of DanÕs old Air Force friends come to visit them once in California. This friend and his wife have lived in Australia forever and stayed with them for a week. Said they did not take a bath the entire time they were there. Geez, I donÕt know if I could take that or not but my cuz and hubby were polite about it. 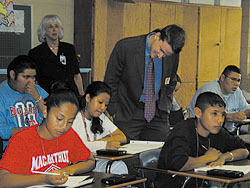 Representatives from the Broad Education Foundation visited the Aldine Independent District last week. AISD was chosen as one of five national finalists for the Broad Prize for Urban Education, an annual $1 million prize awarded to the most outstanding school districts in the nation. The representatives visited the district office, MacArthur Senior High, Hambrick Middle, and Oleson Elementary schools. After Broad representative visit all five finalists, a panel will chose a winner to be announced in early fall. ALDINE – It was a long night for those counting ballots at the Aldine Administration Building, due to a heavy turnout including early voting, but just before midnight on Saturday, the results were known. As reported by Mike Keeney of Aldine ISD to the Northeast News, the voters returned three incumbents to the board. These are Steve Mead, A. W. Jones, and Viola Garcia. Mead was elected for his first full term, having been appointed earlier in the year to fill the position of Carlos Diaz, who resigned. Jones will serve another term, having been on the board for the last 26 years. 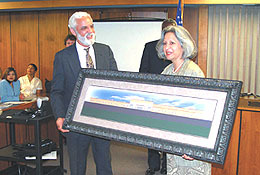 Garcia, the current board president, first joined the board in 1992 as an appointee. Garcia showed strong support by the community, receiving more votes than any other candidate. Position 3 did not have an incumbent after the resignation of Leonard Marcella. 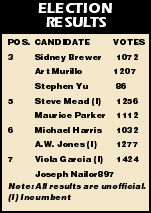 As a result, three candidates ran, and Art Murillo was elected by several hundred votes over Sidney Brewer, with Stephen Yu having a small showing of support. Murillo works as an outreach representative for METRO, and previously was on the staff of State Legislator Kevin Bailey. Returning to the board will be trustees Marine Jones, Emmett Hill, and Rick Ogden. Candidates Brewer and Parker had campaigned on a slate of change, no budget or tax increase, and emphasis on inclusiveness and teaching excellence. The elected trustees had emphasized teaching excellence as their goal, and they are expected to support the current boardÕs direction and administration. In the other election last Saturday, voters within the City of Houston limits decided in favor of Proposition 1, by a 72 to 28 percent margin, which allows the City to renogotiate long term future employee pensions. This promises to eliminate or reduce the need for a tax increase to meet obligations that had been made by the previous administration. Forty-three Aldine ISD seniors received Aldine Scholarship Foundation (ASF) scholarships during a reception held in their honor on Monday, May 10, at North Harris College. The scholarships will enable the 43 students to attend North Harris College, or any school in the North Harris Montgomery Community College District (NHMCCD). Since 1991, ASF has awarded full tuition scholarships to 382 deserving Aldine ISD graduates. This year’s award winners bring that number to 425 students. Aldine Senior High School seniors who received scholarships were: Jacqueline Burnett, who received the W.W. Thorne Award; Soima Badat, who received the Aldine ISD Award; Jackeline Ortega, who received the Deanie Merritt Award; Franchessica Patterson, who received the Shell Award I; Dominique Berry, who received the NHMCCD Award; Jena Resendez, who received the Steven Parker Award I; Dung Nguyen, who received the North Houston Greenspoint Chamber of Commerce Award II; Imelda Martinez, who received the M.B. “Sonny” Donaldson Award I; Miguel Farias, who received the Aldine ISD Faculty Award; Thy Pham, who received the Stan and Suzanne St. Pierre Award I; and Ruth Umanzor, who received the Supertravel Award III. Eisenhower Senior High School seniors who received scholarships were: Maria Jaimes, who received the Greater Inwood Partnership Award II; Nelson Garza, who received the Donnie Drawhorn Memorial Award; Hoang Ngo, who received the North Houston Greenspoint Chamber of Commerce Award I; Luis Ortega, who received the Rigsdell Family Award; Stevi Hargis, who received the Gallery Furniture Award II; Antionette Penright, who received the Shell Award II; Christopher Gamez, who received the Aldine Optimist Club I; Eduardo Berum, who received the NHMCCD Award; and Karmen Batts, who received the Supertravel Award II. 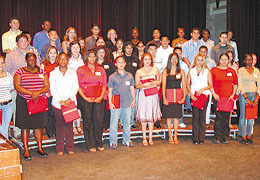 MacArthur Senior High School seniors who received scholarships were: Noe Gonzalez, who received the MacArthur Senior High Award; Aracely Rivera, who received the Steven Parker Award II; John Lomeli, who received the Steve Mead Award; Roxana Rodriguez, who received the Supertravel Aldine Teachers Award; Andrea Velasquez, who received the Doris Davis Award; Shawanda Badon, who received the Aldine ISD Award; Joshua Garcia, who received the Aldine Optimist Club Award II; Veronica Sanches, who received the Supertravel Award I; Akpate Oyibogare, who received the Ron and Mary Oruc Award; Joanna Galaviz, who received the Aldine Improvement District Award; Dizahab Hernandez, who received the Glen and Linda Huntley Award; Adrian Gomez, who received the Gallery Furniture Award I; Sandra Ibanez, who received the Greater Inwood Partnership Award I; Idalia Mendoza, who received the M.B. “Sonny” Donaldson Award II; Victor Leon, who received Houston-Aldine Lions Club Award II; Krystal Pulido, who received the Stan and Suzanne St. Pierre Award III; Don Taylor III, who received the AISD Award; Angel Morillon, who received the North Houston Bank Award II; and Irazema Porcayo, who received the Stan and Suzanne St. Pierre Award II. Nimitz Senior High School seniors were: Melanie Carpenter, who received the Aldine ISD Faculty Award; Eunice Montiel, who received the North Houston Bank Award I; and Carlos Ochoa, who received the Richard and Barbara Lee Memorial Award. Prior to the awarding of the scholarships, the students were addressed by Aldine ISD Superintendent Nadine Kujawa, former ASF recipient Yanira Barrera and North Harris College President Dr. David Sam. ASF is a non-profit organization made up of business people, educators, and members of Aldine ISD and North Harris College. Donations collected are invested and placed in certificates of investment with the principal remaining perpetually untouched. All investment proceeds are awarded directly to pay college tuition for AISD graduates to any college in the North Harris Montgomery Community College District. Individuals who would like to contribute to ASF should contact Steve Mead at 281 442-8127. Attendants at the Phillips 66 gas station at 9400 Airline Drive were puzzled last Tuesday night, when a truck pulled into their station, but no one got out. Upon investigation, they discovered a man who had been shot multiple times in the head. SheriffÕs investigators have identified the man as Juan Carlos Lara, 21, of 800 Gulf Bank Road. Bullet holes were found on the right side of the pickup, as well as on the victim. No motive is known at this time. Police are investigating a shooting at 10800 East Hardy, near Little York. An intruder was shot to death on Friday, when he and another man broke into the tattoo business, which was closed for renovations. A person sleeping in the building was awakened, and fired at the two with a shotgun that he kept nearby. The identity of the dead man has not been released by police. The other burglar fled the scene and is being sought.